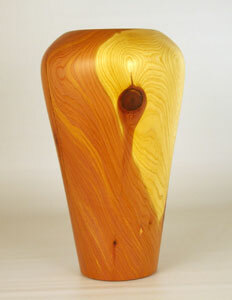 This vase was created from a piece of Juniper that we got from a friends driveway widening project. The colour and aroma of the wood is great. The photo doesn’t get the real colour. Each piece of the tree had long cracks and these were filled with ca glue and shavings from the turning. So far I have turned two of the pieces and once completed, as this one was, they sold right away. I currently have one more on the lathe. I am working on making the form with slightly more curves, time will tell.